No Way Back is not a festival, it is not an event - it is a party. What began in an abandoned Detroit building with a leaky roof moved on to other legendary spaces in Detroit: the Bohemian National Home and 1515 Broadway. Aside from partnering with IT on these parties in Detroit, this will be the 4th time The Bunker has brought No Way Back to Brooklyn. 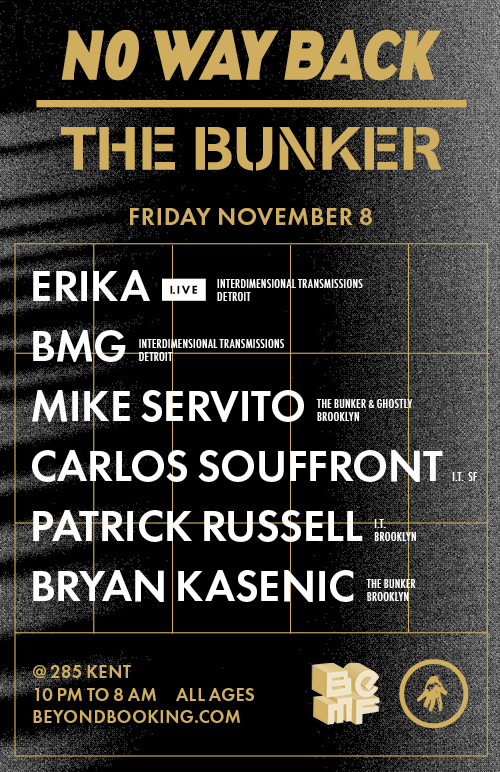 This time we are partnering with BEMF to present the party in the very appropriate 285 Kent space for the first time. We are flying in Amber from IT in Detroit to visually transform the space, and of course Niksound will be in the house. If you don't understand the touchstones of this party, it might be impossible to explain. It is a comment on a continuum. For many of us it began the 90s, searching through fliers at Record Time, calling info lines and buying your ticket at Zoots only to get lost trying to find that elusive warehouse. What was inside? Something amazing... This is our generation returning to the source, feeling a freedom and a heat within the music that resulted in speakerfreaking.